On the whole, Mexico is a fairly prosperous country. It ranks 15th in the world in terms of gross domestic product and is classified as an upper middle-income country by the World Bank. But its wealth is not distributed evenly, and Guerrero state is a perfect example of the poverty and underdevelopment that exists in many parts of the country. Located on the Pacific coast and 120 miles (200 kilometers) southwest of Mexico City, Guerrero state had the most homicides of any state in Mexico last year. There are at least six major drug trafficking organizations operating in the state and competing for territory. Some areas of Guerrera (most notably the Chilpancingo-Chilapa corridor) have almost no government presence and are controlled mainly by drug cartels that offer to “protect” local residents in exchange for their labor in poppy fields. Though this can be attributed partly to geography—the state is mountainous and therefore hard to secure from the outside—it’s also due to the fact that the state was not seen as a priority during various points in Mexico’s history. Why have these conditions developed in Guerrero, while other parts of the country have prospered? One reason is the lack of infrastructure. Mexico experienced a wave of infrastructure development after the second French intervention in the 1870s, and again during the early years of the Porfirio Diaz government in the 1880s. 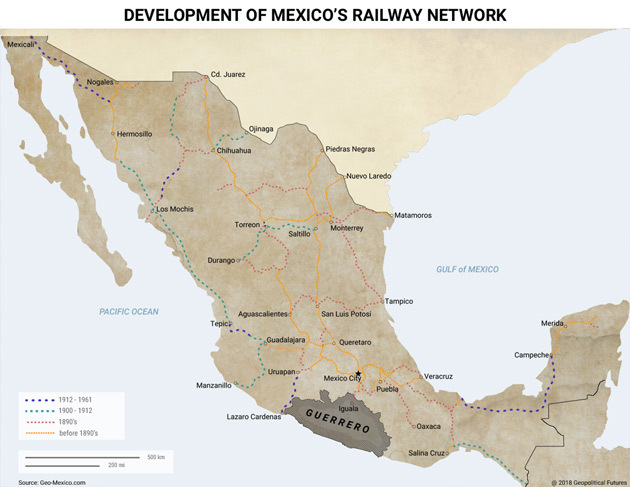 In 1860, Mexico had only 150 miles of disjointed railway, but just 24 years later, this number grew to 7,500 miles. Initially, officials wanted to construct a rail line linking Veracruz (on the east coast) with Acapulco (a port city in Guerrero) via Mexico City. But ultimately, they did not follow through with this plan, and Guerrero was largely left out of the infrastructure boom—a fact that has limited the state’s development ever since. 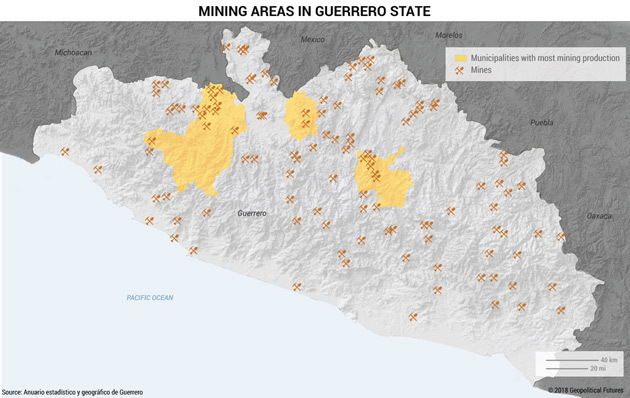 Guerrero’s mountainous terrain makes infrastructure development costly. Heavy rains during summer months also make construction harder and increase the cost of maintenance for existing tracks. At the start of the railway boom, private companies and investors from the US, UK, and elsewhere funded infrastructure projects, choosing which projects to invest in based on business interests. In Guerrero, these interests mainly related to mining because the northern part of the state is rich in minerals and metal deposits. This provided enough financial incentive to construct a railway from Mexico City to Iguala, a city located in the mining region and relatively close to Mexico’s capital. But when metal prices fell at the end of the 19th century, investor interest in the state waned. It was around this time (in 1898) that the federal government stepped in to regulate railway construction. This put the final nail in the coffin for Guerrero’s development. The federal government intervened for two reasons. First, it needed to fill the gap left by the private sector. The fall in metal prices hit Guerrero particularly hard, but it affected the mining industry, and therefore infrastructure development, across the country. This had almost immediate impacts on the local populations and economies that the Diaz government had been so dedicated to supporting in the previous decade. Second, the government wanted a national approach to infrastructure development to ensure that those projects receiving the most support and investment were in the best interests of the country. This resulted in legislation that limited foreign participation in infrastructure, gave the government more control, and introduced a period of time in which projects needed government subsidies before they could move forward. But the central government did not consider Guerrero a priority for rail construction, and the extension of the railway to Acapulco was abandoned. Guerrero is also poorly connected by roads. The first and only major highway in Guerrero connects Acapulco to Mexico City. It was built in 1927 and followed the original dirt road that connected the cities. The construction of the highway significantly affected the state’s development, as economic activity and population centers grew in those areas with access to it. These areas included Acapulco, Chilpancingo, and Iguala, as well as somewhat smaller centers just off the highway like Taxco and Chilapa. A third of the state’s population lives in the first three municipalities—when the other three are added, it’s nearly half the population. 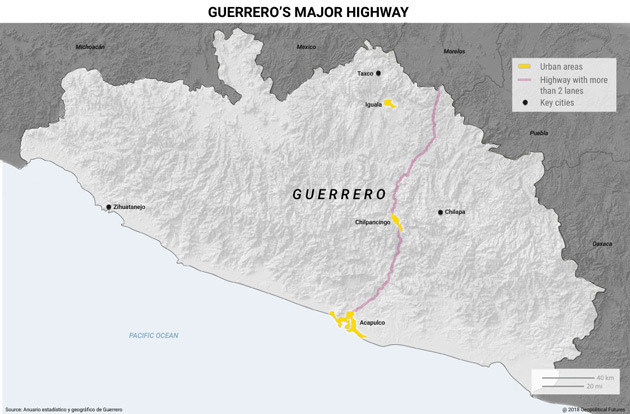 Even today, the areas of Guerrero that are not along the main highway are underdeveloped, desolate, and disconnected from economic activity in the rest of the country. Securing these areas would require heavy investment in terms of both finances and personnel. Guerrero has one key advantage: its access to the Pacific Ocean. Ports usually serve as engines for economic growth and development because they help facilitate trade. Port cities offer benefits for businesses in terms of logistics and often develop into economic hubs themselves. But this hasn’t been the case with Guerrero’s main port, Acapulco. From 1565 to 1814, Acapulco was one of the primary ports used by New Spain, and then Mexico, for trade with China and other Asian countries. However, trade with these countries was secondary to trade with Europe, which meant that ports on Mexico’s Atlantic coast took priority. It was difficult for Acapulco and the surrounding area to fully capitalize on trade with Asia. The port received large shipments from Asia only twice a year because crossing the Pacific Ocean took an incredibly long time given the distance between Mexico and China, as well as the limits of maritime navigation and technology. A trip that now takes two to three weeks took several months back then. Goods were unloaded at the port and a local fair was set up to sell them. After four to six weeks, the fairs would close and the goods would be sent to Mexico City. There, they would be consumed or delivered to other parts of the viceroyalty. As such, Acapulco was mainly used as a transit point for commerce and goods on their way to the capital, and as a result, it did not develop into a major commercial hub. Once Acapulco lost its position as a major Pacific shipping port for New Spain, it never regained it. Mexico’s fight for independence severely disrupted Spanish control over trade and territory, and this impacted Acapulco. Mexican General Jose Maria Morelos took the city of Acapulco in 1814, at which point Spain redirected trade to other ports. In the years that followed, Mexico’s central government focused on securing territory from incursion by the US, France, and even the residents of Guerrero, (which at the time, was not yet a state of its own). In the early 20th century, construction of the Panama Canal was in full swing, which caused development in Acapulco to stagnate even more. The canal allowed goods to be shipped to Mexico’s east coast faster and more inexpensively. Within Mexico, Manzanillo Port (also on the Pacific coast) quickly surpassed Acapulco in terms of infrastructure development, and in 1908, Porfirio Diaz designated Manzanillo as an official port of entry. Today, the ports of Manzanillo and Lazaro Cardenas dominate Mexico’s Pacific maritime trade. Despite increased trade between Mexico and Asian markets and the fact that, globally, Pacific trade is starting to overtake Atlantic trade, Acapulco cannot take advantage. The private sector continues to shy away from investing there, partly because of security concerns in Guerrero and partly because of competition from more developed and reliable ports in other areas of Mexico. This leaves the Mexican government as the primary source of funding for major infrastructure projects, but even the government is reluctant to sink money into this part of the country. May 4, 2018, 1:06 p.m. I appreciate George’s writing on Mexico. In the past, I have written occasionally to request that he do so in order to answer my question as to why Mexico did not become North America’s first choice for low-cost labor and goods instead of China and the South Pacific. This article and the March 19th one on Places Mexico’s Government Can Hardly Reach are a good start.